Album of 2018? You decide. 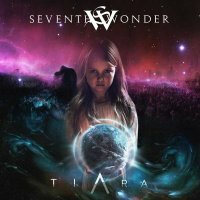 After listening to this new album from Seventh Wonder a multitude of times, there just isn't enough space in the magazine or superlatives in the dictionary for me to even begin to tell you just how good 'Tiara' really is. The band's fifth studio album is something of a concept release about a race of aliens who see Earth and its people as a lost cause, so they come to our planet to end our selfish lives and petty hatreds by destroying us all. According to the band, Tiara (the story's protagonist) could be a person, an idea or an abstract concept that helps the human race; it's up to you as the listener to decide. For me, what then makes this release so special is the musicianship and vocals, alongside the incredible production and mix from the band and Jens Bogren, that combine to create a masterwork of Melodic Progressive Metal; it's something that can only be achieved when a group are in total sync with each other. Seventh Wonder are a band who want to make music that has hidden depths and secrets that, in turn, makes their listeners want to repeatedly explore and re-visit it. Opening the album is 'Arrival', a short musical interlude that flows into the first main song, 'The Everones', which immediately has you hooked into this complex, engaging and dramatic story created by the group. As good as his work with Kamelot has been so far, here we find the true home of the band's vocalist Tommy Karevik and his performance helps elevate an already killer album to a whole different level. With limited space remaining, I'm hard-pressed to pick out individual songs to highlight for your enjoyment, however, the middle section of 'Tiara' – from the single/video 'Victorious' through to the end of the three-part 'Farewell' – contains some of the most perfect Melodic Progressive Metal songs I've had the pleasure of listening to; regarding 'Beyond Today (Farewell Pt. 3)' specifically, they have written and performed one of the best, most heartfelt ballads I've heard – period. Fans of Seventh Wonder (myself included) have been waiting a very long time for this release, eight years to be exact, but I doubt I have to answer the question that's hovering on everyone's lips as to whether it has been worth it because, oh my giddy aunt, it certainly has! Album of 2018? You decide.